It is both enlightening and disconcerting to watch a fly-on-the-wall documentary about the metaphysical presence of evil. 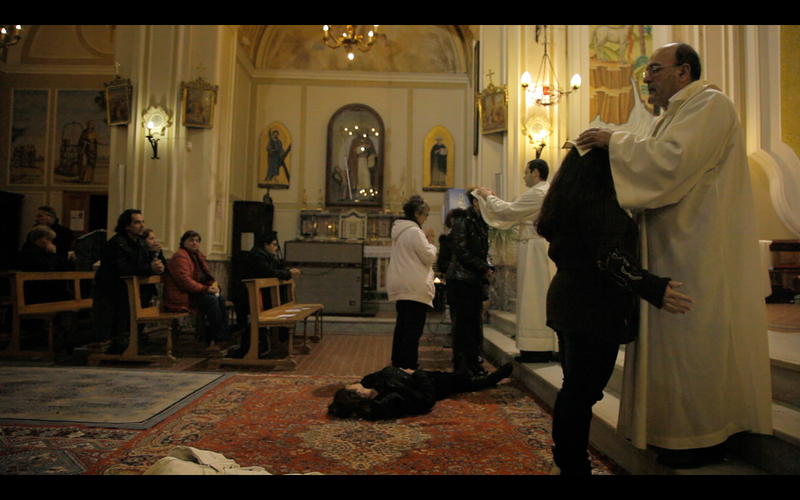 This observational film follows the Sicilian parish of an internationally sought after exorcist, Father Cataldo, and his flock, who are especially prone to demonic possession. It immerses the viewer in a community of parishioners as each week during mass they writhe in pain and speak in tongues, overtaken by the demonic messengers of Satan in their universal battle with Jesus’ forces of light and goodness. It is tempting to try and find some distance from such irrationality by taking an anthropological view on the persistence of practices which died out elsewhere not long after the end of the Middle Ages. Indeed, the southern regions of Italy have held on to rural tradition more than many other parts of Europe, where the remnants of ancient, pagan beliefs were historically absorbed by a Vatican Catholicism seeking not so much to eradicate but to accommodate itself with pre-existing rituals. But exorcism is today a growth industry, with its own professional training programs, a dedicated emergency call centre and a tenfold increase in the number of exorcists practicing in the USA. And so we witness parishioners trying to capture the precise division of good and wickedness in the sky, by finding the right angle to view it through their cameraphones. We hear the Priest ask the celestial beings to protect him on the slip road as he drives back home. A woman’s cough is treated by an incantation to banish the evil spirit that has evidently caused it. This presents a rather pathetic mismatch between the banality of their daily lives and the profundity of the forces they believe are moving them. But as the film goes on, with its quiet closeness to its subjects, it becomes clearer that this is precisely the point: that every disappointment, every grey mundanity or limitation, may in fact be connected to something wider, indeed to the grand eternal struggle of the divine. Their faith is then an ability to remain convinced of such truths precisely where they least appear to apply. Every illness, each misfortune, and all injustice is part of a grand design that makes sense of your own existence. There are disturbing hints that this is not only harmless superstition, or indeed simply an eccentric kind of self-help group, but an abusive relationship of power held by the Fathers over the young, the female, and the often distressed victims of supposedly demonic exploitation. The priestly authorities offer not merely salvation but place a great deal of blame over victims for their own unfortunate position. It becomes very difficult in watching their responses to know where to draw the line between liturgy, theatrics, protest and mental illness. As one woman puts it, “If I’m not possessed, well then I must be mad.” One teenage girl is clearly traumatized by being in the church. At the same time, under cover of possession, these parishioners get the opportunity to publicly scream and shout, to spit and spew, in what may at least for some be a cathartic and certainly very involving experience. Deliver Us does not attempt to explain the material it documents. What it does is offer an affecting portrait of a community where extraordinary fervor intermingles with the utterly everyday.